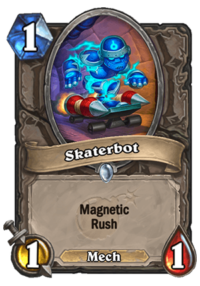 The upcoming Hearthstone expansion, The Boomsday Project, is going to feature a new keyword – Magnetic. It’s an entirely new mechanic centered around Mechs. 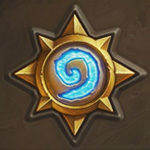 It means that Boomsday Project will be the first expansion since Goblins vs Gnomes to be centered around the Mech tribe. In this guide, we’ll gather all the information about new keyword, and all the new cards featuring it. Cards with Magnetic can be played like a normal card too, ignoring the keyword. In order to fuse, play Magnetic card to the LEFT of a Mech. If you play it to the right, nothing happens. Fusing counts as a buff. 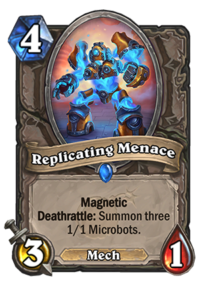 The resulting Mech will have combined stats of both minions, as well as effects of both. If the card gets Silenced, the extra stats and all of the effects disappear. You just get the base, Silenced Mech. It works exactly like you would Silence a regular buff, such as Spikeridged Steed. 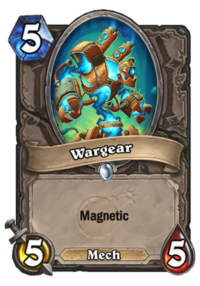 You can fuse a Magnetic card into any Mech – it doesn’t have to be Magnetic too. If a Mech on the board can attack, fusing a Mech into it won’t change that (it will still be able to attack). It doesn’t create a new minion, but rather buffs the existing one. 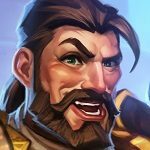 Learn more about the mechanic via this Hearthside Chat video where they showed off three new Magnetic cards! 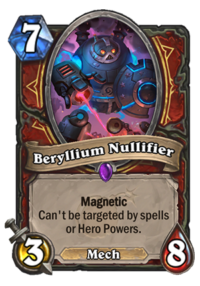 So how does the magnetic keyword interact with summon counts, like the warrior quest, if you buff a mech originally does not have taunt with a taunt magnetic mech, will it count towards the mission? 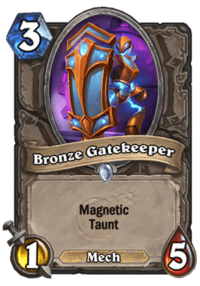 If you buff a mech already having taunt with a magnetic taunt mech, will it count towards the quest? What happens with kangor’s endless army if a magnetic minion gets silenced? Does it keep the buff or nah? Just to clarify what you have said. 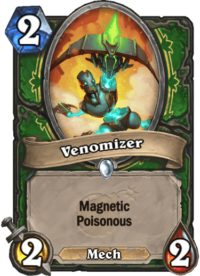 You mentioned that it will likely be a spell when positioned to the left of a magnetic minion, right? 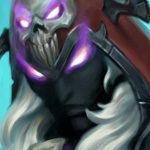 Will it count as a buff for Lynessa? How does it work with Handbuffed Magnetic minions? For example if you trigger the Deathrattle of Val’Anyr and it attaches to a magnetic minion and then play it, will it transfer the +4/+2 + deathrattle too? If yes, how does it work with the legendary Paladin spell? Will the resummoned minions only have the combined text of the fused minions or also the Val’anyr death rattle + stats? And what about secret triggerings (Explosive Runes, Frozen Clone, Snipe etc.)? 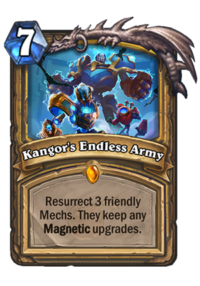 Do mechs magnetizing with another on the board counts as minions played, or just as a buff, but not a spell (no triggering Counterspell)? Maybe it just counts as totally another type of card (like Death Knights or sth)? Not really. It’s only works like a spell, but it doesn’t count as one. For example, Counterspell won’t stop it, and it won’t generate a Fireball with Antonidas on the board. 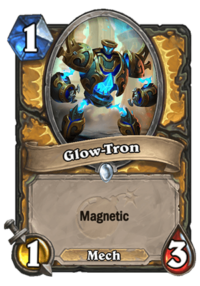 So, just to be clear – once you’ve attached a magnetic minion to an existing mech, the magnetic minion goes away and the mech now has the stats and text of both cards, correct? The placement thing is quite important and makes positioning much more interesting. I think they could have done it with the choice screen like when u are playing lets say – Wrath. But this way its weaker and its a “tax” for using it. Imagine u have 2 same mechs and oppenent will also choose which one to attack to lower his health according to the possition for further possible fuses. It relly brings nice new elements into the game. What i woder about is the itneraction with triggering secrets. I would say its always counted as minion and even if it fuses, ur opponent will get normal copy of the minion with mirror entity. Just my guess. Does this work like a battlecry? Or will summoning a magnetized mech next to an existing mech apply the buff? In order to activate Magnetized, you need to play it right LEFT to the Mech you want to combine with. Any other placement will result in dropping it as a regular minion. What happens when you have 2 mechs on the board and place a magnetic in the middle? It magnetizes with the right one!? 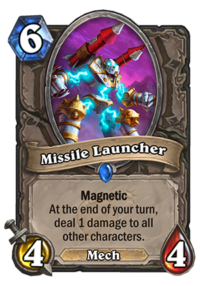 You need to play Magnetize Mech on the LEFT SIDE of the Mech you want to fuse it. So if you put it in the middle, the right one will be buffed (because you put Magnetize on the left side of it) and the other one will remain intact. Saying “it can attack immediately” is a bit misleading. It can’t attack immediately if the original mech you’re fusing with can’t! Yes, you’re right, I’m going to clarify that. 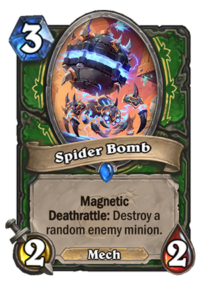 In the case of the Spider Bomb after you’ve buffed another mech… what happens if your opponent hits it with silence? 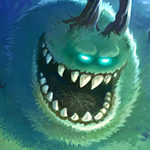 Naturally, silence affects the deathrattle and the buff, but what about the minion itself? 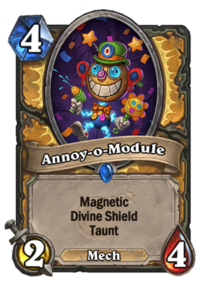 Will they be forced to split into the two original minions because Magnetic would be silenced as well? 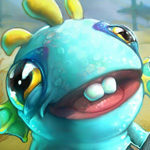 In the example with mechwarper, am I right to assume that if they do split, both minions are silenced? I think it will be as simple as ‘all enhancements provided by the magnetizing card disappear’. So if you magnetize a 2/2 vanilla mech with Spider Bomb and it gets silenced, well … it’s a 2/2 vanilla mech once again. You can attack immediately. There’s a video on the office boomsday website. What if I want to play the minion to the left of the mech for positioning and I don’t want it to fuse?? Does it mean I have no choice? Sounds strange Blizzard would overlook this. Time will tell if this will make mech positioning awkward or if it doesn’t matter at all. On the one hand, it means that you need to pay even more attention to your positioning now – where you put your Mechs might be more important. It also looks pretty cool that way. On the other hand, it could be more clear and flexible. When playing a Mech with Magnetize, it could just pop up a “Choose One” window, where you pick whether you want to play it alone or Magnetize it into something (that option would be greyed out if there was no Mech you could Magnetize into). 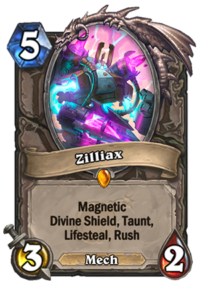 If you have a X-mech since your last turn, and you play a minion with Magnetic to enhance it’s stats… Can you attack inmediatly with the enhanced “X-mech fused with the Magnetic mech”? Or is “summoning sickness” part of the combined effects? It’s a great question, but I’m afraid that we don’t know that yet. We’ll update the post once we find out! Update: It seems that a fused Mech can attack immediately! It doesn’t create a new minion, but rather “buff” the existing one.